Cannot be Normal Summoned/Set. Must be Special Summoned by the following effect. If 3 or more cards are in the same column (Quick Effect): You can Special Summon this card from your hand. You can only use this effect of "Iron Dragon Tiamaton" once per turn. 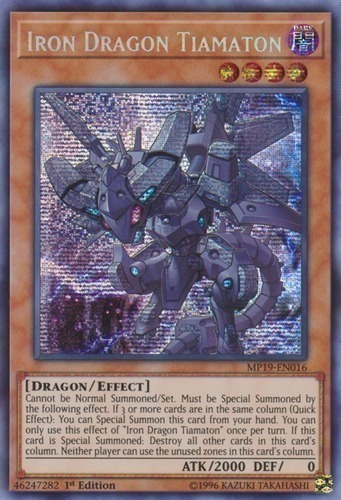 If this card is Special Summoned: Destroy all other cards in this card's column. Neither player can use the unused zones in this card's column.